It is sad, but true that I need to go on a stash diet. This is my closet where some of my stash lives. I may post more photos of my mess later, but this will show some of my problem. Since it is my diet, I am making my own rules. 2. I will give myself $6 to $20 for Mill Hill bead kits that are completed. I have quite a collection and need to make a dent in them. 3. If anything is given away, I get an extra $5. It is out of my house so I deserve a bonus! 4. Doesn't matter when I started the piece, only when I finish it. It needs to be stitched, not framed or finished to count. The only exception is my HAED-Reptiles. I paid by the page for it. 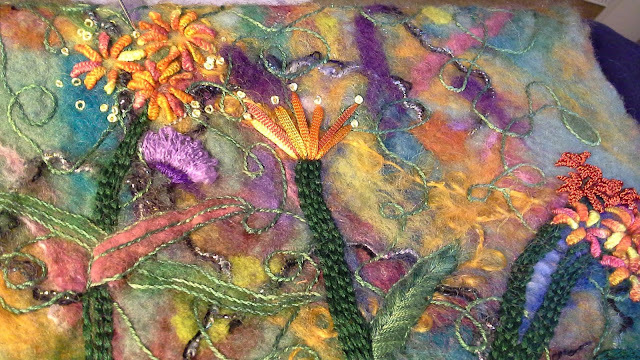 This is from Epic Stitching who used to host a Stitch from Stash Group. 5. My needlepoint counts. I will measure the piece and pay myself by the square inch. 6. Any monetary gifts I receive can be added to my spending money. I am starting with the money my mom and dad and my MIL gave me. Hey! They said I could spend it how I want! 7. I also do paper crafts so I will give myself $1 for every art journal page or scrap booking page I do. I get $1 for every pound I lose a month or if my weight stays stable. I found out in this past July that I am pre-diabetic. I have lost 20 pounds but need to lose 20 more. I have several friends who have lost 50+ pounds but have gained some or all of it back. I can't do that. I know how difficult it is to lose weight and keep it off and I feel like I need a carrot to keep at it. $1 won't break me and it will motivate me. I may add $1 for every aerobic mile I do too. Again, it won't break me and it will motivate me. Remember:MY DIET, MY RULES! The above is subject to change as needed. Thanks for all the nice comments. I am still resisting the sale as I realized I have 3 of Kathy's pieces in my stash! Crazy!! !Well, actually four if you include Spirit of Jean, but I am working on it. The Sprats Head variation went quickly and I hope adding the Kreinik will too. I am avoiding my Drawn Thread Sampler. Too much Christmas up still. Maybe next week I will bring it back out. Not a great photo, but it is done! Now I have one less thing to stitch in 2017. 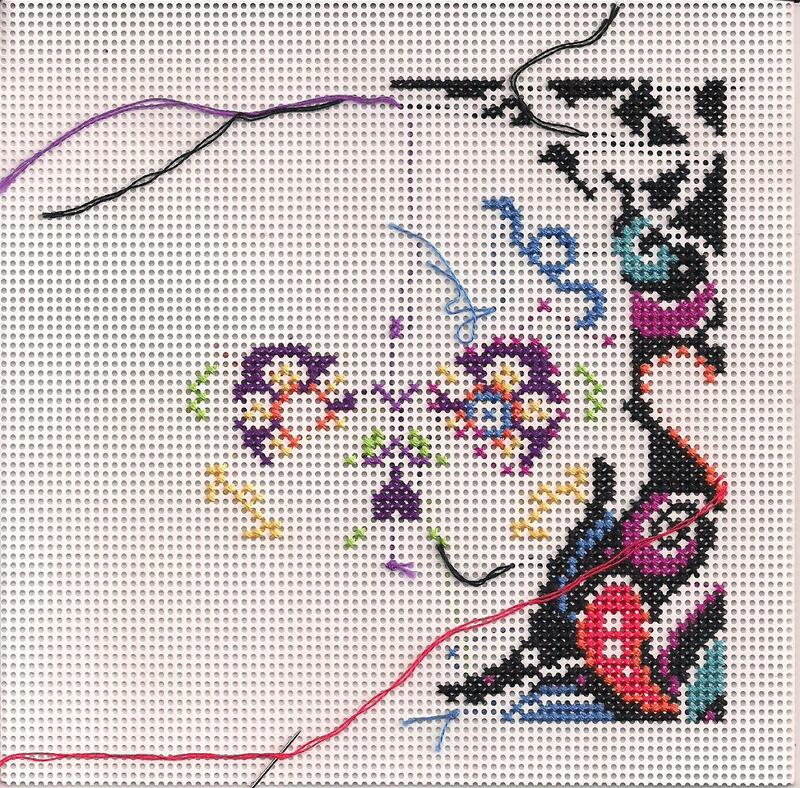 Which reminds me: I am putting myself on a stitching diet starting in January. Looking at the mess in my basement, I need to do something. But ...Kathy Rees is having a sale at her site. At least I thought I saw something about it on Facebook. I thought I rotated this photo but the tablet disagreed. Anyway, I got a bit more done on this kit. It won't be done before the end of the year, but I am making progress. I took some time tonight and did some stitching. Yipee! I need to add one more stitch in Kreinik to these, but it is fun to see progress. The larger Mill Hill kits have multiple bags of beads so it is easier to stitch. So I have made some progress. Sorry for the bad photo, but look at the lovely wall hanging my friend made for me! I am not stitching much, but lots of baking is getting done. But I think I can get this done by February. When people see it they often are startled by it, especially kids. I don't think I could hang it in my house but I do love the colors. First, the Nativity Trilogy ornaments will eventually go on a wreath or at least that is the plan right now. I need to finish the other 5 before I decide. 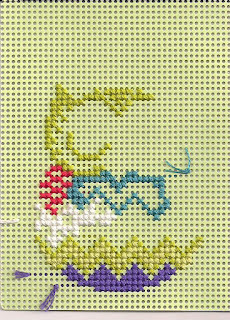 I was working on this last night and I stitched up to the bottom diamond shape when I realized I made a mistake and ripped it all back out. Note to self: DON'T STITCH WHILE YOU HAVE A COLD! After I ripped,I watched some tv then crawled to bed. 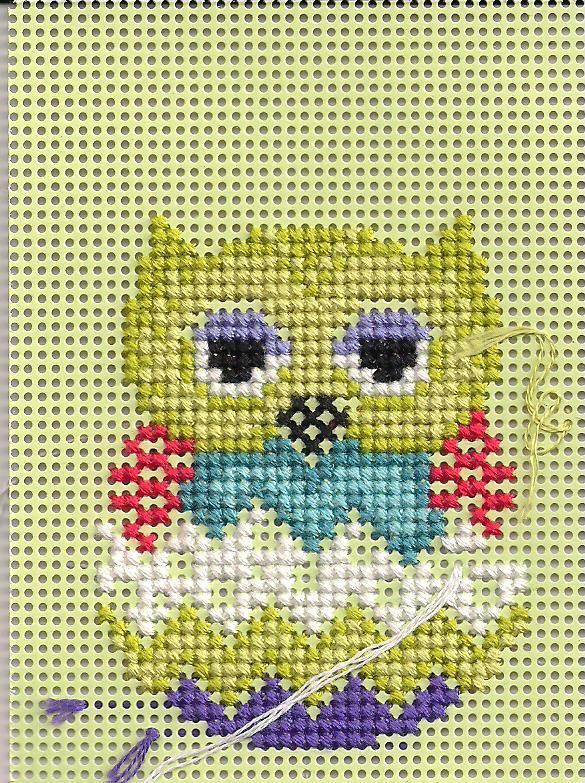 Hopefully I will feel like stitching this evening. 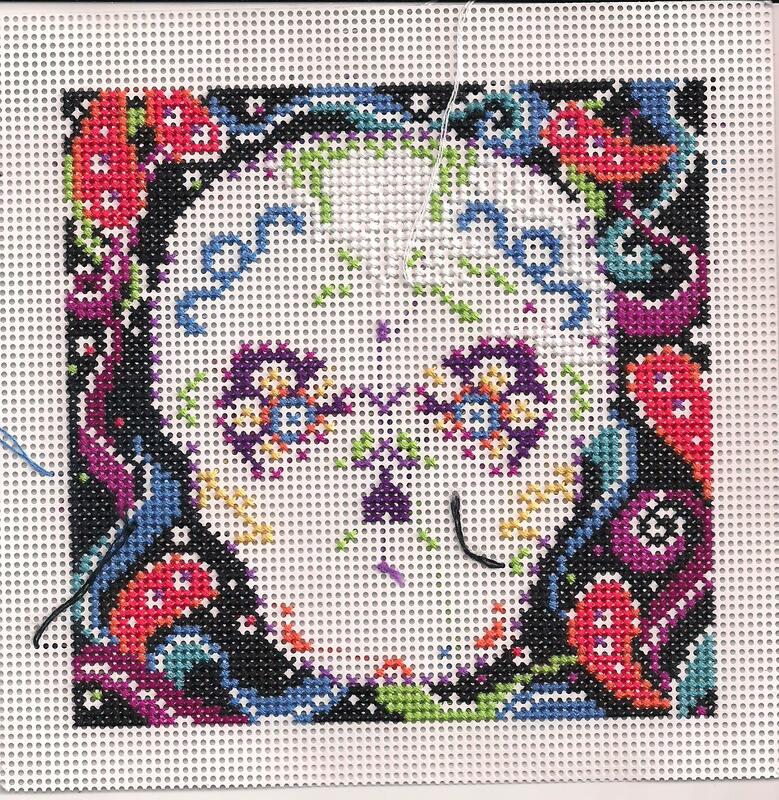 I also need to start my list of things I want to stitch this year. I do that every year and I have a few things to finish in 2017...How about you? Do you make a list? Here they are all cut out. 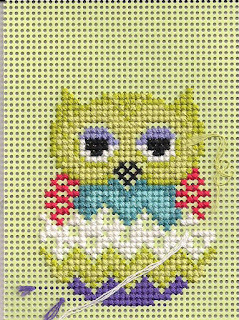 The last thing I do is cut out the picture that comes with the kit and place it in my stitching journal. I am not very good about keeping notes on my stitching, but it is fun to look and see all that I have stitched over the years. I feel like I am making a little progress, but it sure is slow! 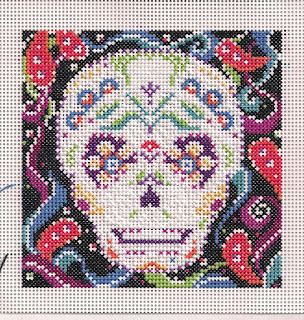 I am not much of a Halloween person and I don't do much decorating, but I love seeing everyone else's stuff so when Jo over at Serendipitous Stitching hosted this blog hop, I had to join in! Here is my little Halloween corner, although Elizabeth is not strictly Halloween! I stitched the banner ages ago. My oldest was an only child at that point. 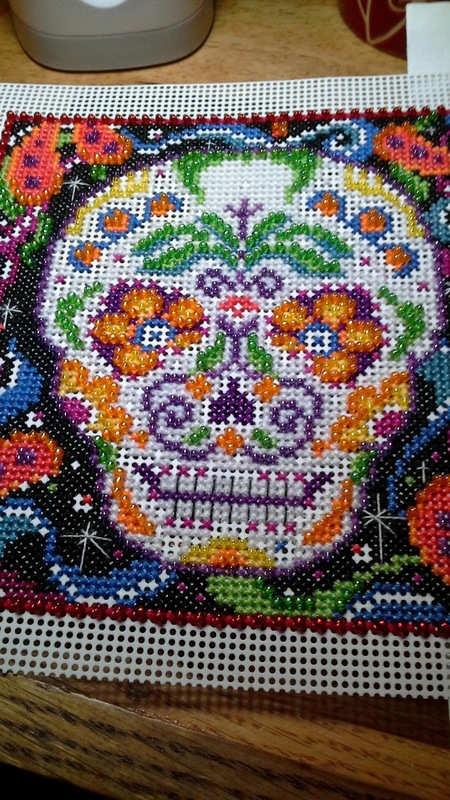 And look at my Sugar Skull progress! 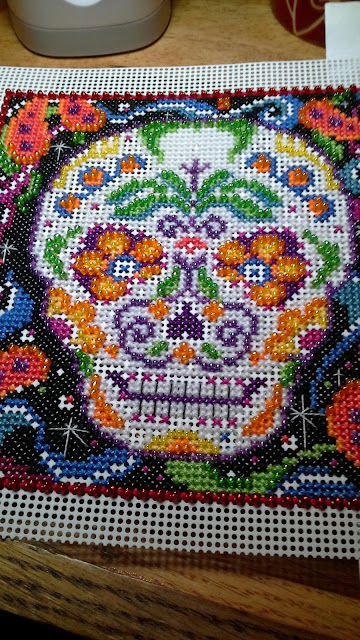 I think I just have to add a little more white and then I can add beads. A fun project! I'm having fun with this project. My local guild had their monthly meeting and I am leading it. Only a few showed up for the day meeting so I had time to sit and stitch. Not too bad as I did visit too! Loved all the comments about how you track your stitching. 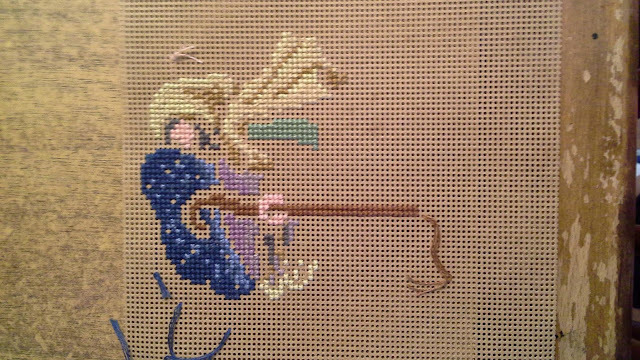 Most of the time I don't care, I just stitch, but some projects require me to find a way to motivate. Since Sugar Skull is a gift and has a deadline, I pretend I have a plan. A friend and I were discussing a blog we found where the artist works for 30 minutes every day on a painting or page and is done. Her husband commented that she does that every day-she exercises 30 minutes every morning. So she is going to start working on a stitching project for 30 minutes a day. It made me think, "I stitch 30 minutes most evenings on a single project." Not a huge difference, but progress. 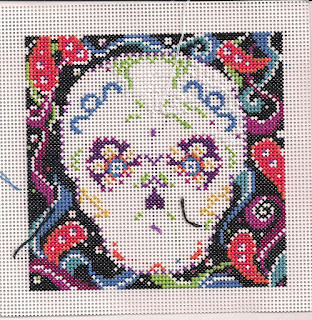 I was counting stitches and trying to get about 30 done a night on this piece, but minutes are easier for me to keep track of. What about you? 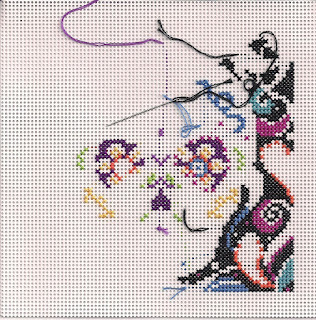 Do you stitch for 30 minutes on one project? Can you see progress on it? I finished this a while back and had it framed. Now I need to find a spot to hang it. Gay Ann Rogers is having her annual sale October 20-26. Right now she has a story running on her webpage which I found kind of cute. The top photo is the real Drawn Thread Sampler. 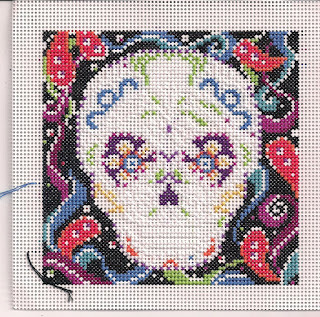 I had hoped to get some work done on it, but I needed to finish the bottom row on the Doodle Drawn Thread Sampler. I managed to get it done before it started storming. Next week is my local guild's meeting and I need to be ready to teach. That means that I probably won't work on this for a few days, but it has moved back upstairs and back into my rotation. I have gotten back to work on the felted bag. I was waiting to stitch on it as I was unsure where to go. Finally just started stitching and these cast on flowers seemed to work. Need to find some beads for the center.